(Newser) – The wreck of a passenger steamer that went down in 1888 with the loss of 16 lives has been found sitting upright on the bed of San Francisco Bay not far from the Golden Gate Bridge. In one of the city's worst maritime disasters, a steamer named the City of Chester departed for Eureka on a foggy day, only to be hit by a much larger steamer arriving from Hong Kong with Chinese passengers aboard. The wreck was found by National Oceanic and Atmospheric Administration researchers using a sonar system; the agency's forerunner originally thought it had found the ship's remains just a month after the sinking, the Washington Post reports, but now the location has been confirmed. So, you take a story about the discovery of an old shipwreck and turn it is into a story about racism??? What is wrong with people? Everything doesn't have to be about race. Most likely NOT the only ship that has gone down in those waters. The first of many yet to be found. 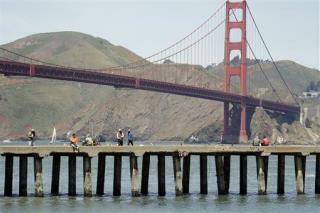 For that depth to occur naturally it has to be close to the Golden Gate bridge. Most of the SF bay is very shallow, with huge areas less than waist deep, almost mud flats. Even around Alcatraz the water is only about 40 feet deep.